Waiting on Wednesday is hosted by Breaking the Spine. Each week offers the opportunity to spotlight an up-an-coming release you are looking forward to. When Nicole Renard returns home to Galveston from an eastern finishing school, she's stunned to find her father in ill health. Though she loves him, he's only ever focused on what she's "not." Not male. Not married. Not able to run their family business, Renard Shipping. Vowing to secure a suitable marriage partner, Nicole sets out with the Renard family's greatest treasure: a dagger personally gifted to Nicole's father by the pirate Jean Lafitte. Many believe the legend that the dagger is the source of all Renard Shipping's good fortune, though Nicole is sure her father's work ethic and honorable business practices are the keys to their success. Before she can board the steamer to New Orleans, Nicole finds her father's rivals—the Jenkins brothers—on either side of the gangplank, ready to grab her and steal the dagger. Quickly, she decides to instead travel north, to Liberty, Texas, where she can decide what to do next. Darius Thornton needs a secretary—someone to help him get his notes in order. Ever since the boiler explosion aboard the "Louisiana," Darius has been a man obsessed. He will do anything to stop even one more steamship disaster. The pretty young socialite who applies for the job baffles him with her knowledge of mathematics and steamships. He decides to take a risk and hire her, but he's determined her attractive face and fancy clothes won't distract him from his important research. The job offer comes at exactly the right time for Nicole. With what Darius is paying her, she'll be able to afford passage to New Orleans in mere weeks. But Mr. Thornton is so reclusive, so distant, so unusual. He can create complex scientific equations but can't remember to comb his hair. And his experiments are growing more and more dangerous. Still, there are undeniable sparks of attraction between them. But Nicole is leaving soon, and if she marries, it must be to a man who can manage a shipping empire. Darius certainly doesn't fit that description. And the Jenkins brothers have not given up on kidnapping Nicole and seizing the Lafitte dagger for themselves. 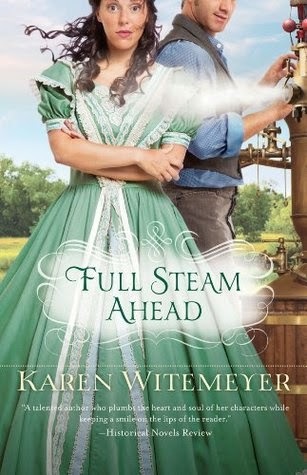 I have really, really enjoyed all of Karen Witemeyer's previous stories. The characters are fantastic and unique. There is also a good dose of humor in all of the stories. I can't wait to how this story plays out. This book is already on my wishlist! I cannot wait for this one either! Karen's books are always amazing! I adore her books! They are great for re-reading :) Really looking forward to this one!